This variety show/drama is one of the latest KBS original productions. It started airing June 26th, releasing episodes for eight days straight. The show centers around seven girl group members who will write and act their own self-produced drama. The seven members of the cast are also in the girl group project, Girls Next Door (옆집소녀) throughout the show. They will act as a girl group that struggled to come on top, revealing all the difficulties but also the funny moments of idol life. 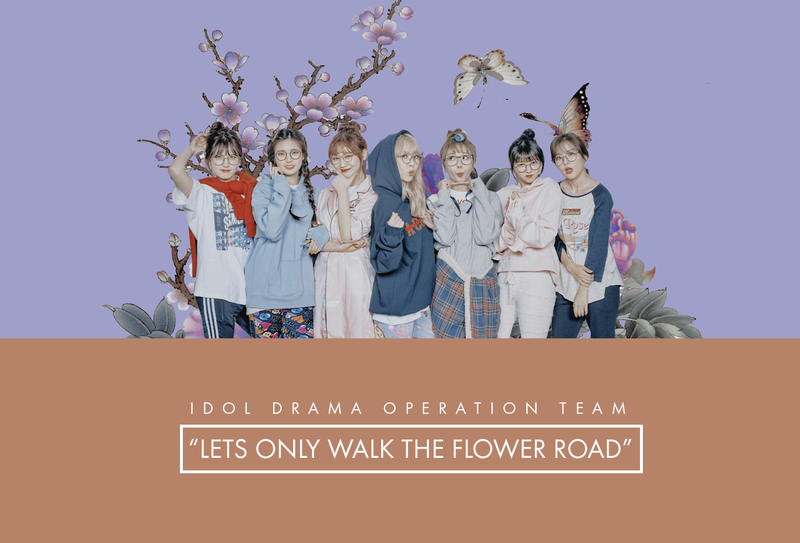 If you’re looking for something light, not too demanding but at the same time informative, you can watch this drama and learn more about what happens behind the scenes of idol life. The drama follows the “adventures” of seven girls who have to face the cruel reality of the showbiz world. The girls will form a girl group that comes from a quite unknown company, where the CEO has barely any money to produce their first album. The routine for them is usual: waking up, being reprimanded by the manager, wanting to eat something other than salad, and performing. That’s how the drama opens – in the present in which the girls are waiting to sing on Music Bank and they’re now rising idols, nominated for 1st place. After coming in contact with arrogant seniors, PDs, and fellow idols, the girls reunite in the waiting room and begin to reminisce about their past as trainees. The drama is, in fact, a huge flashback. The girls will remember about their daily hardships, ranging from being threatened of being thrown out of the group if they couldn’t lose weight to forgetting friendship due to the harsh competition between trainees. All girls have their own stories and peculiarities but some of them, more than others, are relevant to make the plot flow. In particular, Seulgi and Yooa’s story seems to be the most interesting. They are the ones who trained the longest and they should be aware on how things works in the idol business. However, Seulgi came from a sort of talent show called “Rookies” which gave her a great amount of popularity and made her the favourite of the CEO. Yooa hopes to get the same treatment from everyone too, but up until now it seems like she only managed to become jealous of Seulgi. At this point, the CEO decides to make the girls participate in a survival show called “The Five”, where only five members will be chosen for the future debut. The girls have to compete to come out on top, and among fights, tears and disappointments, the chosen final members finally get to debut in a group called “Girls Next Door”. Needless to say, their first song and album are an utter failure. Being deep in debt, the CEO doesn’t know how to go on with the production of another album and that’s why he suggests a member change in the group. This member change will bring “unexpected” returns and a new rebirth for the girls that will begin to go towards the road of success. This project presented itself as unique and experimental in its approach with the public and the fans with two sides of the same coin, the variety show part and the drama part. Watching the drama without following first the whole process behind its production is like missing more than half of the drama itself and just the enjoyment of seeing it from another perspective. While working on the scripts and the scenes, the girls are much more relaxed and don’t have the pressure of acting, despite still working hard to get a satisfactory result. And the interactions among them are totally adorable and spontaneous!! They all decided together their own roles and wanted to insert their personal lives too. Some of these added stories are 1. Sohee’s real account about working in a restaurant peeling onions and ignoring her grandma because she was too busy; 2. D.ana’s story about reaching a daily target weight; 3. Yooa’s story about eating hamburger in the bathroom stall; 4. Sujeong’s story about being called “Bbang Deok” by her fans and not liking it at first; 5. Moonbyul’s account of having been a vocalist before becoming a rapper. All these true stories serve their purpose of depicting the conditions of trainees as realistically as possible, making us viewers imagine how they actually behaved in real life in these situations. This was surely well-played! Meanwhile in the drama we perceive more the burden of them being acting idols with little to no experience. In general, the acting was far from perfect. That’s not to say it was plainly bad but it was one of the points of the drama that could be improved with practice, considering that they all seemed to have great potential. Honestly, Seulgi and Yooa came out as the best ones. Probably because they also had a wider range of scenes compared to the others, and they were full of feelings and sincerity in the most emotional ones. In particular, I liked Yooa’s scene at the bus stop when, after crying for feeling inadequate, she looked at herself in the mirror and it was like she was looking at another her while saying “you can do it!” trying to cheer herself up. I also loved Seulgi and Yooa’s scene in the practice room where Seulgi confessed to feeling all the burden of being the favourite, whereas Yooa simply confessed to Seulgi “My dream is you”. Omo, plot twist. Is this a kind of forbidden love story between trainees too? I would have been here for it. On the contrary, Sohee’s acting seemed a bit too exaggerated, especially in the fight scene between her and Seulgi. And I can say she’s probably the only one who had some more difficulties in properly conveying her character. She, however, seems to improve after the falling out of the survival show and the sad scene with her grandmother which led to an emotional crying scene. About the characters, they seem barely sketched out but we can still hear the echoes of their relationship in the way they speak and interact with each other. I’m not entirely disappointed by the way the girls themselves have decided to assign features and characteristics to everyone, but they lost me, in a way, when they completely went off the mark with some characters. For example, Moonbyul was supposed to be a charismatic, strong, straightforward, very realistic girl. Basically, a girl crush. Well, looking at it now, it seems like she didn’t change so much compared to her real image as an idol. I would have liked it much more if they decided to give them a girly character or something completely opposed to her personality, so we could have seen her in a different guise, especially if she acted ironically in her role. She could have challenged herself more. Sujeong’s character is also elaborated very poorly and it seems like she has no depth. All she talks about is jokbal, jokbal, hamburger, jokbal and more jokbal. Ok, I get it was supposed to be funny seeing her so obsessed with food and being so clumsy but we literally have no inkling and details about her feelings. The rockish elements that should have been part of her role, as decided by the girls, are missing too. Only when she talks about the bad comments she received for not looking like a celebrity do we get a glimpse of a stressed idol who doesn’t know how to deal with negative comments. It would have been nice if they explored more of this side too, since all K-Pop fans know how influential and destructive the internet world can be for idols. Exploring this obscure aspect of being an idol would have been really interesting to see. Somi is also another character I don’t get. According to the girls, she was supposed to be a girl who looks prettier when she doesn’t speak too much, otherwise it would be chaos. But what does this really mean? She has her funny moments too, exactly when she exaggerates and talks too much, and they’re also cute to see. But once again, we only get a glimpse of her “real” self when she fights with Chungha, and she accuses Somi of being arrogant for correcting her dancers’ mistakes. I think it would have worked more if she was depicted since the beginning as a self-conceited but skilled trainee who then learned to fix her errors along the way. It’s like they only got to the surface with some characters and didn’t bother to explore more of them, maybe for the time limit or simply for the fact that this was firstly born as a webdrama, made for fanservice and just nothing more. That was actually funny but yeah, Moonbyul is still there in spirit and body after she left with the CEO. What kind of amazing talent. There are a string of rookie idols that always open up every music show. The public, however, remains cold. The music is all the same, they all look the same, and they’re easy for the public to ridicule for coming out in groups with no distinction from the other. You’re not guaranteed a spot on a music show just because you’ve released an album. It’s all in how fast and how hard your manager can peddle for you. Every Monday morning at around 10 a.m., the coffee shop in front of KBS is bustling with managers from the nation’s top agencies. Some are at CEO level while others already have seven to eight years of experience stashed under their belts. From top agencies to ‘nugu’ producers, there’s a wide array of them gathered and it’s all for none other than to meet the ‘Music Bank’ PD. The PD himself is busy dashing in and out of meetings and sitting down with producers so the managers end up waiting an average of three hours in the coffee shop. If you’re a senior in the industry, you get the perk of being able to meet him first… but three hours of waiting will barely get you five minutes of a face to face chat. Even managers from bigger companies aren’t an exception. The problem is with the smaller agencies. They have no foundation and thus must rely on shelling out big money to hire expensive managers who have more experience in the field. PDs have caught onto this tactic, though, and have started to call them ‘promotional managers’. They reject to see them outright. Girls Next Door’s manager and CEO basically do the same. They just “humiliate” themselves and submit themselves to the sad reality of the system that seems to be created only to mortify the efforts of people who work hard. They managed to convey the scene in a quite funny way by making the CEO follow the PD in the toilet so he could beg him in his weakest moment. He did good. I probably would have threatened him with the toilet paper! And honestly, I also grew to like the manager and the CEO, because, despite their harshness towards the girls, they just continued to work hard for the girls’ sake. That’s how I learned that their job is as difficult as the idol job. The OSTs, in general, were all very good. In particular Parasol by Dal Shabet’s Subin and Deep Blue Eyes by B1A4’s Jinyoung were the most addictive to me. All in all, I enjoyed the show in many ways. Firstly, because of the girls who, despite their little shortcomings, formed a really talented and homogeneous group. They made me laugh mostly with their cringeworthy and hilarious moments. Secondly, because it gave me a deeper insight on how it is to live life as an idol, being strictly controlled every minute, without a minimum of freedom. But it also made me understand why people choose to go down this road when they have nothing but dreams. Money, success, recognition, and appreciation are only the secondary goals of all this. The first one is simply to follow a calling, a sort of vocation, especially if there’s nothing else you can do but sing. It’s like a necessity. The show as a whole had a great potential of being much more than what actually occurred. However, it was nullified by the numerous editing errors, the bad camerawork, the non-finished scenes, the sudden jumps from one scene to another and some plot holes that haven’t been developed further, due to only 12 minutes of broadcast. The major limit is exactly in the fact that the whole process of production lasts much longer than the drama. That’s why the final output seems a bit disappointing. It didn’t properly live up to the premises.